PRISM director Carl Norgard and lead investigator Kelley Kennedy were interviewed on Halloween 2012 on Omaha, Nebraska's Q98.5 FM on the Pat & JT in the Morning radio show. Several new EVPs from the historic Squirrel Cage Jail were played. It was noted that the temperature was sometomes 10°F to 15°F colder inside the cemetery than outside of the cemetery. 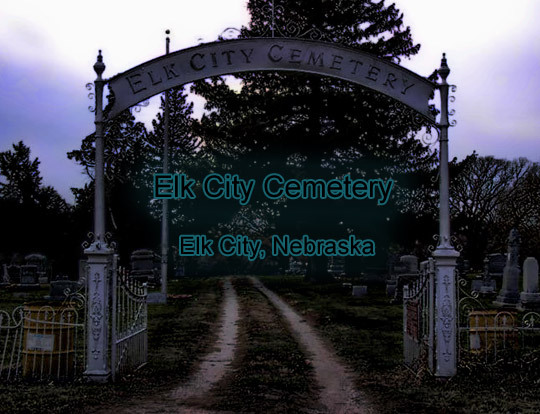 Audio was recorded during our investigations of the cemetery, but no EVP were captured. The PRISM team took this photo which reveals an ectoplasmic mist at the the cemetery gates. Smoking was not permitted, and the weather was in the mid 60's with low humidity and no precipitation. None of the PRISM investigators saw the mist with their own eyes, it only appeared in the photograph.